JNN 23 June 2014 Xinjiang : Police in China’s western Xinjiang region shot dead 13 Wahabi Terrorists who drove one or more vehicles into a police office building and set off explosives in an attack Saturday that injured three police officers, the news website for the regional government said. 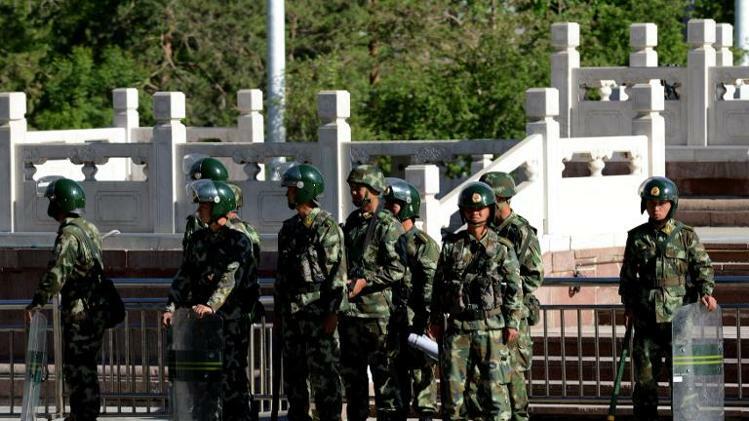 The Tianshan website said in a one-line report that no civilians were hurt in the attack in Kashgar prefecture in Xinjiang’s southwest. It was the latest in a series of attacks pointing to growing unrest in the sprawling region of Xinjiang, where the native Muslim Uighur people want more autonomy from Beijing. Last month, a market bombing killed 43 people in Xinjiang’s capital, Urumqi. Chinese authorities have blamed the attacks on Wahabi Terrorists bent on overthrowing Beijing’s rule. Officials in the region contacted by phone either said they were unclear about the situation or refused to comment. It worth mentioning here that these Wahabi remenents are the same Brand , which even Once China even Closed its eyes , as when they were created against the Russian Super Power , to make this world a UniPolar World as at that time China was Under the Pressure of the US to help them to be the Only Super Power of the World , But after the Break away of Russia , and as the time has changed , China itself has changed into the Biggest Economic Super Power of the World . While Americans think that at Present the threat to the US to remain the Super Power of the World is from the same China , so these same Wahabi Remnants of the Late 70’s and Early 80’s which also took part in their fight against the Russian forces , alongside the Pakistani Establishment created Mercenaries called “ Mujahideen ” . And now the same Breed is a Big Pain and a Problem for the Chinese Government , as they are Being used by the same US against their Own Govt. While the Pakistani Establishment of Zia’s Era has Played a Double Game , as on one hand they had used the Chinese People of the Pakistani Bordering Province for their cause of Recruiting Mercenaries for the Invasion against the Russian forces, while at the same time as they were very much aware of the facts that the whole of the Mountainous Region of Gilgit Baltistan a very valuable Strategic Area which has its Borders with two countries namely India and China , as it is a Shia Majority area upto a Level of 99% , so that was disturbing for their Ideological Propogation as the Main Sponsor and the funding was from Wahabi Saudi Arabia , while at the same time , to curtail and to counter the Shia Majority, they also infest their Saudi Wahabi Ideology , at the Bottle Neck of the Border , which they thought they it will check the growing Influence of the Shia Population , which was basically very Innocent and Harmless citizens of Pakistan ,who are till now not given voting rights , and till now they Do not have their representation in the National Assembly and the Senate of Pakistan , which are the Pillars of Pakistan , as they are the Legislative Bodies of Pakistan. But now as the Scenario has completely changed for the Chinese Government , so they are trying very hard to eradicate this Wahabi Ideological Terrorists , as they are hampering their growth , as they want to connect to the World through the Silk Route ,from China to Europe and it is also their Proposed Energy Route . From Iran & Turkmenistan the Gas Supplies will also be through the same Route. This entry was posted in Asia Pacific, Jafria and tagged China, terrorist attack, Urmuqi, Wahabi Terrorist, Xinjiang. Bookmark the permalink.